This is Robbie, a working sheepdog. Robbie was my first paid commission back in 2005. My brief was to capture him while working a flock. I was mesmerised by he focus on the sheep. The day however was gloomy and the first set of shots didn't come out too well so I had to return and do it all over again. It was no hardship as I found it so fascinating. 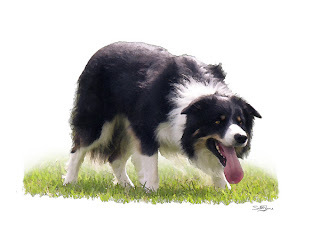 Lovely portrait of a working Collie in action!